This summer, Adjaye Associates celebrated the opening of the Francis Gregory Library in Washington, DC. The $11-million, LEED Silver-certified building opened in June, setting a high bar for community library design in the nation's capital and across the country. 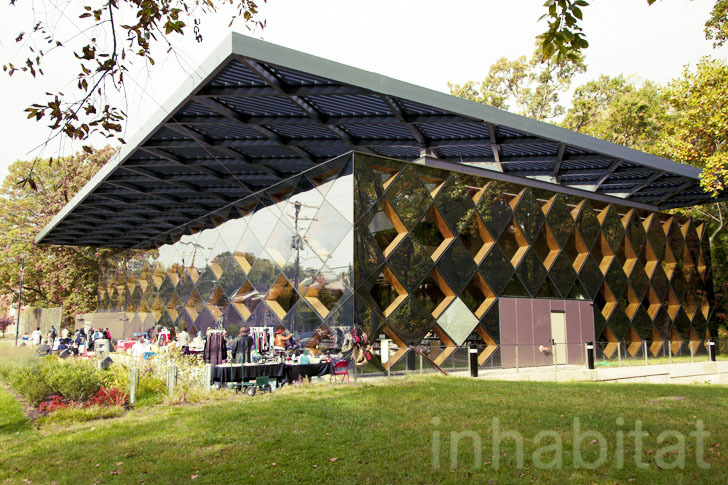 The gorgeous structure was built with passive solar heating in mind, and it features a large canopy that helps to control sun exposure in the summer. The new Francis Gregory Library is built at the edge of Washington, DC’s Fort Davis Park, where a Civil War-era fort once stood to defend the nation’s capital. The transparent library looks out on the leafy, wooded park, and the surrounding trees are reflected in the building’s glass. The walls of the new library are made of plywood with large, diamond-shaped cutouts for windows. All four sides of the building are uniform, and the checker pattern continues on the roof, where the materials change to metal and glass. The glassy building perfectly frames the park outside, and from any point inside the building visitors can catch a glimpse of the greenery nearby. The two-story library serves children, teens and adults, and it features public meeting rooms and conference rooms on the second floor. The new Francis Gregory Library is built at the edge of Washington, DC's Fort Davis Park, where a Civil War-era fort once stood to defend the nation's capital. The transparent library looks out on the leafy, wooded park, and the surrounding trees are reflected in the building's glass. Adjaye Associates won a competition to design two new neighborhood libraries for Washington, DC. The building's glassy exterior reflects its surroundings like a calm lake. "Our mission, with the Francis Gregory Library, has been to offer a new way to experience books, reading and story-telling," writes London-based architect David Adjaye. "Rather than a traditional closed building, this library is porous and open, with the canopy providing a welcoming entrance that invites people inside," writes Adjaye. "Conceived as an extension to the park, it is not only a place to gather, but also a place of contemplation and learning." The walls of the new library are made of plywood with large, diamond-shaped cutouts for windows. Gorgeous pendant lamps illuminate the computer lab. All four sides of the building are uniform, and the checker pattern continues on the roof, where the materials change to metal and glass. The glassy building perfectly frames the park outside, and from any point inside the building visitors can catch a glimpse of the greenery nearby. The two-story library serves children, teens and adults, and it features public meeting rooms and conference rooms on the second floor.